That list includes a few names that you’d expect, as well as a couple that you can certainly eliminate because they play on really, really bad teams. But it’s an easy way to look beyond points per game, which, by itself, would indicate that Jamal Crawford is the runaway favorite for the award and that Dion Waiters has been the Cavs’ best reserve. Anderson Varejao has averaged 2.7 more rebounds per game than any other Sixth-Man eligible player in the league. If we want to adjust for pace and minutes played, we can look at the PIE statistic from NBA.com/stats, which takes a player’s numbers (with weights added to each) as a percentage of the overall numbers that were accumulated while he was on the floor. 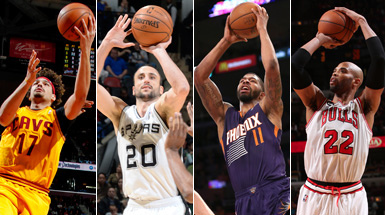 Four guys – Tyreke Evans, Taj Gibson, Markieff Morris and Varejao — are on both lists. Crawford ranks 16th in PIE (11.1 percent), while Manu Ginobili ranks 16th in total efficiency (838), having missed 12 of the Spurs’ 74 games. But there’s one more thing we need to look at, because the ultimate job of a team’s bench is to build on a lead or at least sustain it. And when we look at how their teams perform with them on and off the floor, a few candidates rise to the top of the list (which I cut down to 10 guys who appear on at least one of the lists above). Rank = Rank among 235 players who have played at least 1,000 minutes for one team. So Varejao comes out as the biggest difference maker, with the Cavs almost 11 points per 100 possessions better when he’s on the floor than when he’s on the bench. Ginobili hasn’t played a ton of minutes, but the Spurs’ offense receives a huge boost when he’s in the game. It’s also interesting to note that Gibson’s impact has been on offense (mostly because the Bulls have been great defensively no matter who’s on the floor). On-off-court numbers obviously need some context, especially when you’re looking at a guy like Crawford, who has two teammates (both starters) who are top-10 players in the league. He’s played 1,415 minutes (71 percent of his 2,002) with Blake Griffin, but only 955 (48 percent) with Chris Paul. And though the Clippers have been better with Crawford on the bench, they’ve still outscored their opponents by 6.8 points per 100 possessions with him on the floor. So his scoring numbers are far from empty and he is helping his team build on leads. Still, if you look beyond points per game, the numbers see Ginobili and Varejao as guys worthy of first place votes, while Morris and Gibson should also be near the top of the list.